Many students find learning scales rather tedious and as such may neglect preparing them well for an ABRSM exam. However, they are possibly one of the easiest parts of the exam to get full marks in. In fact it was the ONLY in the scales section of the exam that I always got full marks, many years ago as a teenager. 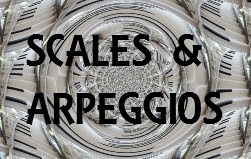 I would recommend starting your practice with scales, it not only gets them out of the way if they are not your favourite thing to practise, (a bit like eating your least favourite vegetable first on your dinner plate) but also it acts as a good warm-up for your pieces. Added to this I would recommend that you take time to learn your fingerings accurately. In order to play scales securely you need to develop muscle memory, so that your fingers “automatically know where they are going”. Muscle memory is only developed by repeating the same action over and over again, and this in turn can only be achieved if you use the same finger pattern every time. By the time you get to the higher grades, the scales will be going so fast you need to be on autopilot, you won’t have time to think!! Check out this video for the different speeds of scales at various speeds. Next I would recommend that you think of the scales in groups of 4. This is how they are written out in the ABRSM scale books, and by doing so it will help you develop an even tone. By playing them in groups of four you will naturally stress a different note in each octave and so they will sound more even. On the other hand, many students with will play with "bumpy thumbs". Take for example the scale of B major. In this particular scale the thumbs in both hands are on the same note and also on the only white notes in the piece. If you try to play it now, without thinking of groups of four you may well notice a "bump" on every thumb note. Now try it again, thinking in groups of four and you will be naturally stressing a different note in each octave, B, E, A#, D#, G#, C#, F# and then back to B. Finally, mix up the order you play your scales. If you always play them in the same order, when the examiner asks you for a random scale on the day this might put you off. With this in mind I often suggest to my students, to make scale cards, that is, little pieces of card with the names of each of the required scales written on them. Then you place all these cards in a pot and pick one at random. If you play it well you can place it in a different pile of “correct” scales. If you play it wrong, don’t play it again now, put it back in the pot and try a different scale. It will come up again later and you want to practise getting it right first time, not 2nd 3rd or 4th time in the exam. This will also ensure, that the scales you have the most difficulty with, will get the most practice. Continue like this until the entire pot, has been transferred to the “correct” scales pile. And then the next day start again. Also don’t forget to practice them hands separately, even if you are on a higher grade. You may be surprised to know, how many of my students can play very well a scale hands together, but if I ask them to do a single hand, it completely confuses them. Be prepared for this in the exam. I hope you found this post useful and if so please share. By putting into practice the suggestions I have made, you too can get full marks in the scales section of an ABRSM exam.